The Marathon Man with my nephew Jack after the 2011 Brisbane Marathon. Trent Morrow is his name, but I’m pretty sure it’s fake. The amazing Marathon Man is an Australian lad out to claim the Guinness World Record for the Most Marathons Run In A Calendar Year. The currently recognised Guinness World Record is 114 and was set on 31 December 2011. A subsequent claim for the record has been made for a total of 157 marathons in the calendar year ending 31 December 2012. This new claim is yet to be assessed by the Guinness organisation. 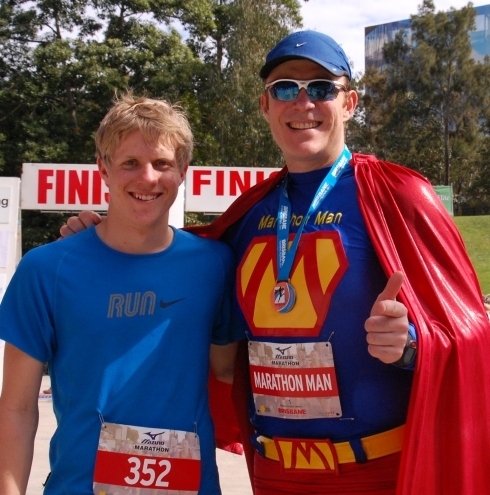 Marathon Man’s vision is to complete 160+ official marathons in the calendar year ending 31 December 2013. Along the way he hopes to raise awareness and support for key corporate & charity partners. And not only is Trent doing all that, but he’s also a great bloke and a runner who runs for the love of it …read more here.